After getting 2nd place at my first fencing tournament in Seoul my club invited me out to dinner. It was a successful tournament with 5 medalists from our club, Seoul Fencing Club, and I got invited to join everyone for dinner. One catch; I was the only white guy and they barely spoke English. The majority of the conversation was in Korean so I clearly understood none of it but was able to follow clubmates to a barbecue joint near the tournament; we sat on the floor filling up this restaurant with our group of 10 fencers. It was a diverse group with a few highschoolers girls who were “too good to compete today” and were coaching. After all they are the best team in all of Seoul! We had a few young adults along with an older gentleman who was very animated and I’m sure hilarious but also embarrassed at his lack of English. Most of the others could understand me if I spoke slowly and between their joint vocabulary we were able to have some basic conversations. While I had seen most of them 2-3 times a week at practice this was the first time I’d really gotten to know anyone other than my English speaking fencing buddies. 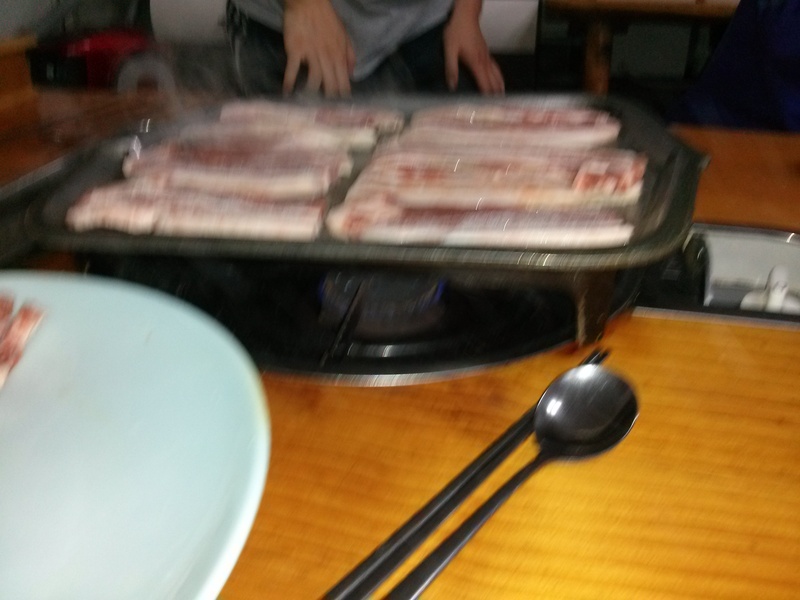 I went through the basics about where I was from, that I was a teacher and broke the ice with a few funny fencing stories as the bacon-like pork belly, known as Samgyupsal, came out. 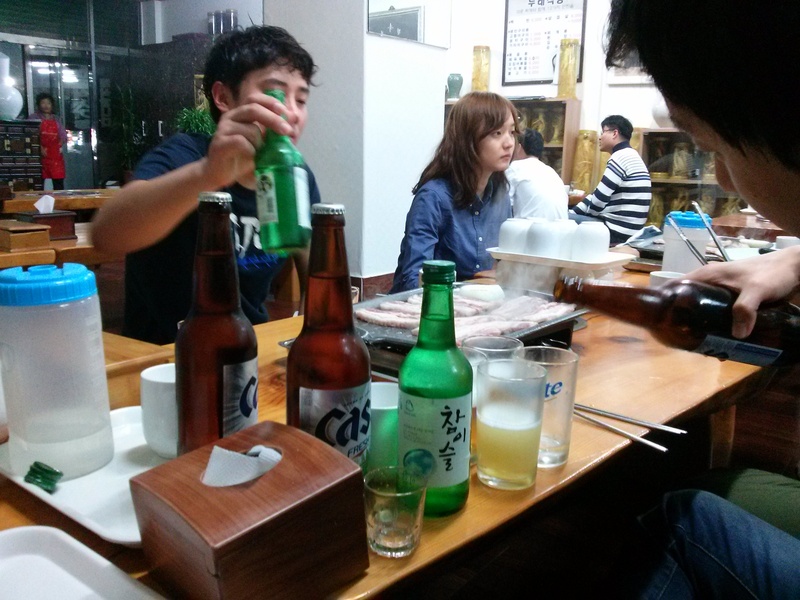 More importantly was the arrival of Mekju & Soju (beer & a rice-wine) which we combined for a more potent Somek. It was delicious and I’m glad I learned a few of the customs earlier like not pouring your own drink how to accept/give a drink while showing respect. With a quick “ganbei!” the drinks began flowing and the meat started grilling. 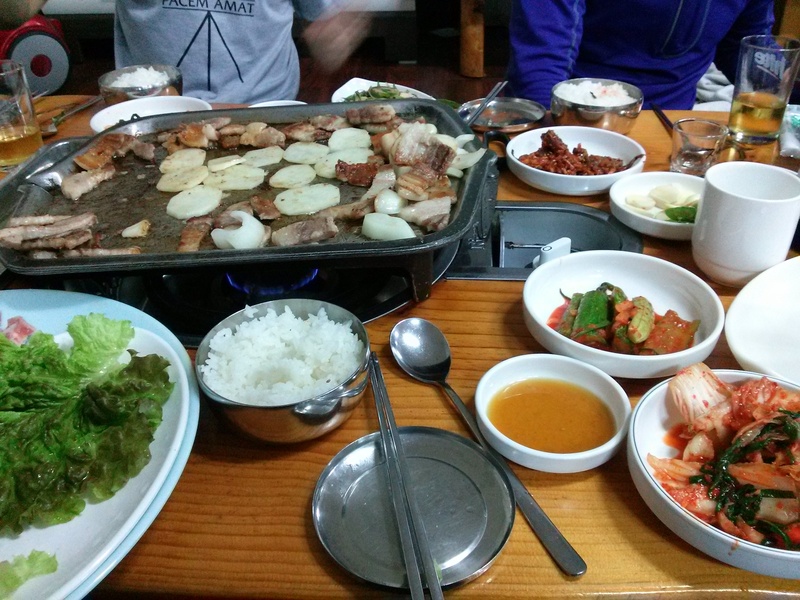 The Koreans took care of all the cooking and the banchan came out shortly after. Conversation went back to Korean and I learned a few new words when a new banchan came out. I didn’t know what it was but it looked spicy so I grabbed a small portion. It was tasty and i took a little more. This time it crunched hard. Turns out it was fried soft shell crab and the older gentleman and bonded with me over this savory treat with another toast. Tonight, no bugs! 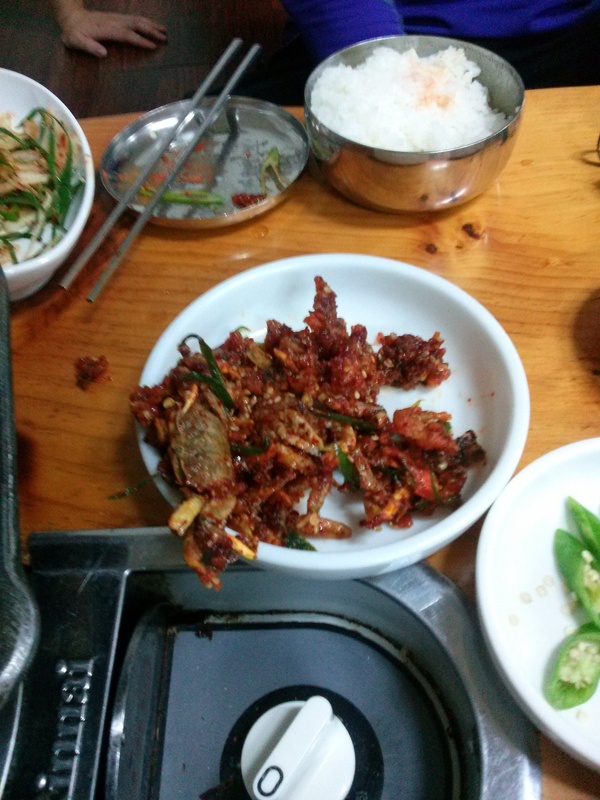 Although the crunchy crab resembled a larger cousin of bundaegi it was much tastier! The evening got a little crazier when I looked over and half the table was gone. I saw them huddling by the kitchen when my neighbor explained that one of the girls had a ring stuck on her finger. I suggested using ice to try and reduce swelling but it was too late, they were already cutting it off! The poor girl was in tears but a trooper about the whole thing while the older guys chuckled at her unfortunate situation. I took it as an appropriate time to ask if she was right handed or left handed; upon finding out it wasn’t her dominant hand I told a few stories about some my old teammates punching walls in frustration and injuring their fencing hand. Tonight may have embarrassed her but at least she wouldn’t leave disarmed while it healed up (oh fencing priorities). We had a few more glasses and finished up the meal. I think I successfully impressed my new clubmates with my fencing and 2 month old knowledge of Korean culture! Can’t wait till the next tournament on the 24th!